Last year for my 30th birthday I wrote a list of 30 things I wanted to do in my 30th year (you can see the full list here). One of the items on my list was to “spoil myself with something lovely”. I intentionally left it vague because I wasn’t quite sure what I wanted to buy for myself. I was originally thinking jewelry, but I have a lot of nice jewelry already and I don’t wear most of it. So I kept thinking about it and couldn’t come up with the perfect thing. 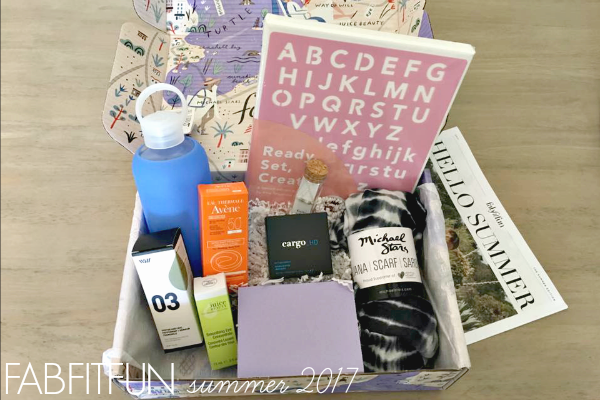 Then last month Adam’s sister-in-law and I started talking about the FabFitFun subscription box. Neither of us had tried it, but we talked about watching videos of people opening their box and how fun it would be to get our own (one of my friends has a subscription and really likes it too). And then I realized, this is how I could treat myself! So I signed up for a year subscription! It’s not exactly what I had in mind, but it’s been so much fun already. Plus I have three more boxes coming so it’s the gift that keeps on giving. 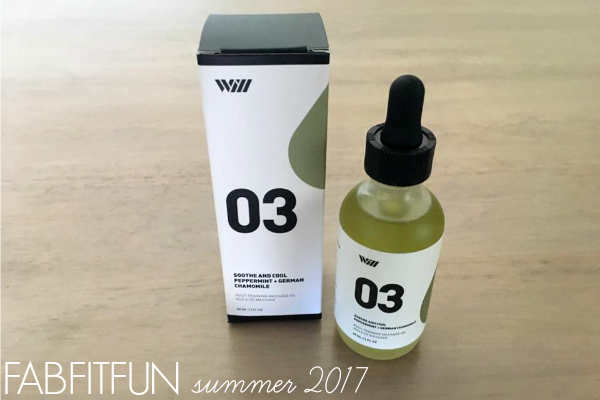 My summer box arrived over the weekend, so I thought it would be fun to share everything that was in this season’s box. 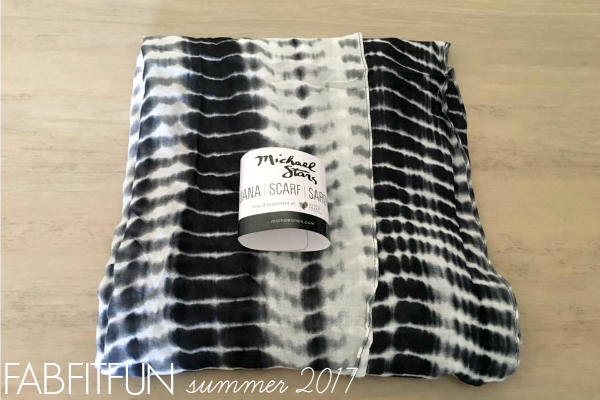 The first item is a Michael Stars Ruana ($54 value). It can be worn a lot of different ways, but I’ll probably use it as a scarf or pool cover-up. I picked the black and white alligator print because I figured it would go with everything. Honestly, this is something that I would never buy myself, so getting it in this box was a fun surprise. The next item is a Kris Nations Mystic Bar Necklace ($58 value). Isn’t the glass bottle packaging so cute! I picked the howlite in silver, which is supposed to enhance intuition and promote calmness. 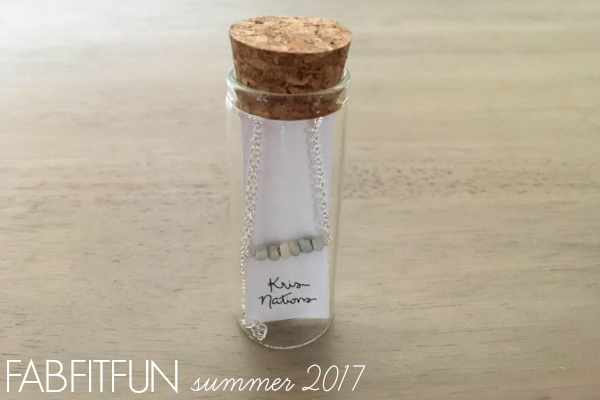 This necklace will look good with so many different outfits. 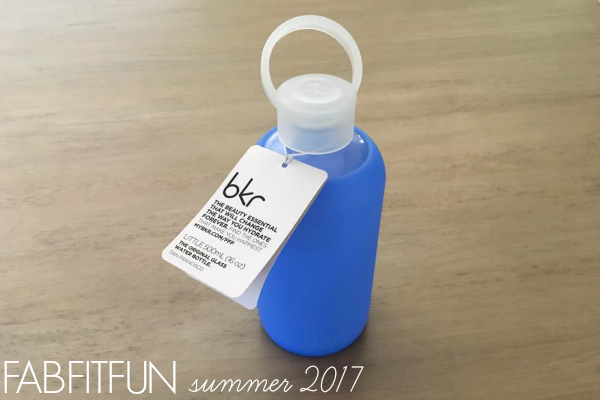 Also in the box was a BKR glass water bottle ($35 value). I picked this blue color, but it was also available in pink. These first three items listed were announced before the box shipped and if you’re an annual subscriber, you could pick your colors. Otherwise, they ship a random color/design. I would have been happy with either color water bottle, but I was relieved to pick my Ruana design (I didn’t like one of the colors). The next three items were a surprise. The first item is Juice Beauty Smoothing Eye Concentrate ($29 value) and I’m really excited to try it. My under eye area could use some help (ugh, wrinkles) so hopefully this will help. The next item is Avene Eau Thermale Ultra-Light Hydrating Sunscreen ($24 value). I already use a SPF 45 moisturizer every day, so I don’t really need this item, but I’m willing to try it…maybe I’ll like it more than my current product. And finally, in the box was this Cargo HD Picture Perfect Highlighter in Bronze ($30 value). I don’t currently use a bronzer, but I’m trying to up my makeup game, so this will be fun to try. Next up was a mystery choice item. Before our boxes shipped we could pick either a mystery fitness or beauty item. I picked fitness and was sent Way of Will Post Training Massage Oil ($29.50 value). It says that it provides a soothing and cooling sensation, so this will probably feel amazing on sore muscles…now I actually need to go to the gym. The last item was another mystery choice. We had to pick between traveler, artist/DIY, or chef. I had such a hard time choosing, but I ended up picking artist/DIY. 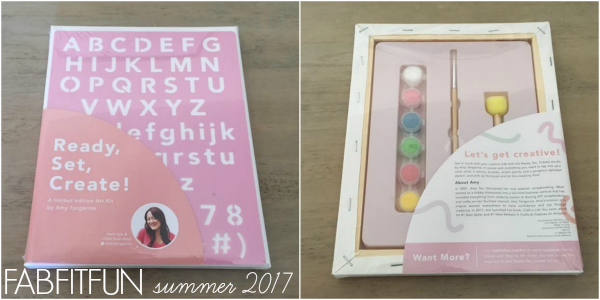 The item was an Amy Tangerine Art Kit ($22 value) and honestly, it was a pretty disappointing item for someone who is already crafty. It’s basically just a canvas and cheap letter stencil, plus paints and a brush/foam stamper. I wish I would have picked chef. I saw on another review post that it was a Himalayan Pink Salt Kit. Overall I’m really happy with my box. I wouldn’t have picked most of the items out myself, but that’s kind of the point. My box included $280 worth of products for only $45 ($180 annual subscription/4 seasonal boxes). I also love that everything is full size. Years ago I subscribed to Birchbox, but that only includes sample sizes (for the most part) and I started collecting WAY too many of those. Of course it’s cheaper than FabFitFun, but I think it’s worth the extra money for full size items. If you want to try FabFitFun, you can use this link to save $10 off your first box. You can always just sign up for one box using the code and get everything above for $40, then cancel if you don’t want to spend the money every quarter. OK, who else subscribes to FabFitFun? Or what other subscription boxes do you like? We used to get Bark Box for the dogs, but it started to get too much (although it was fun while it lasted and now Ringo thinks every package is his Bark Box). What a fun box! I really like that water bottle! Omg score! Now THIS is a subscription box I can get behind. 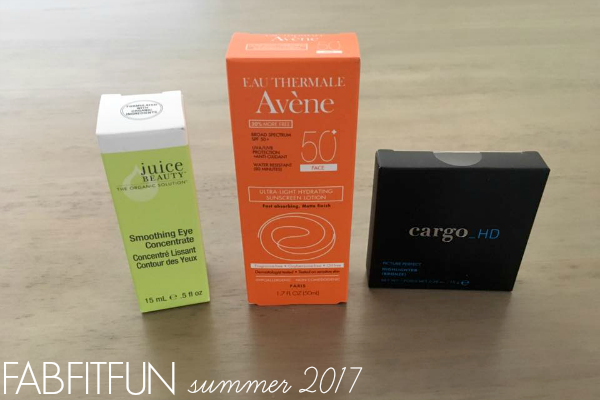 So many summer goodies! I'm checking them out now, thanks! That necklace is amazing! Love it.